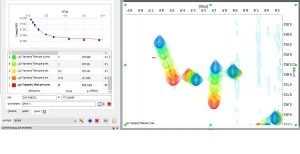 This powerful tool has been designed to carry out chemical shift perturbation analysis for fragment-based drug discovery. 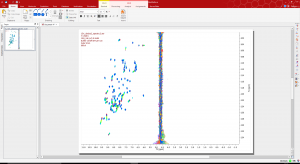 Mnova Binding automatically processes 2D HSQC type of protein-ligand titration spectra, tracks the peak movement, and computes the Kd‘s for multiple peaks. 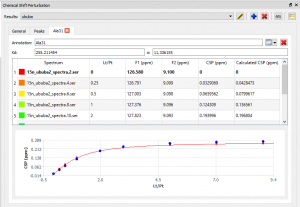 This tutorial intends to guide you through the main steps of your chemical shift perturbation analysis. 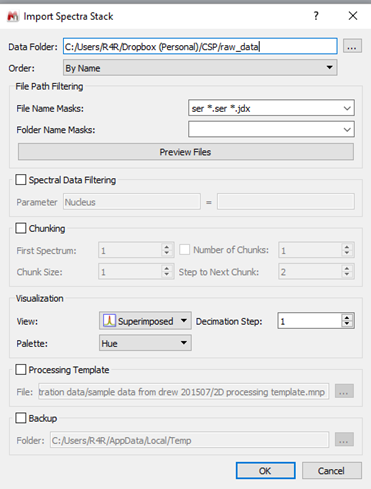 Select folders containing raw data (i.e. from “1” to “9”) and drag and drop them into Mnova. Use the ‘Data Browser’ panel (it has to be activated from main menu ‘View/Panel Data Browser’). Also, with the “+” button you can add the path where your data are located. 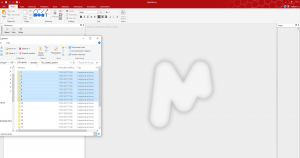 As in the first option, select the folders containing raw data and drag&drop them into Mnova. Once spectra are opened in Mnova select all pages containing the desired spectra. Selection can be done either by doing right click ’Select all’, or pressing SHIFT while selecting. Then click on the icon highlighted below in order to superimpose selected items (alternatively the same command is located in the main menu ‘Stack/Superimpose Items’). 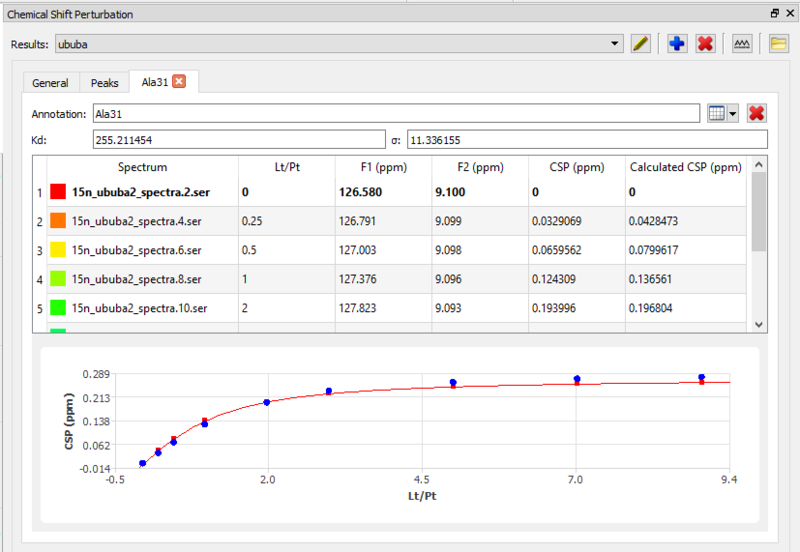 Finally the stacked plot is created in a new page, as the second page after the first selected spectrum of the stack. You can also rename the page (right click ’Edit Page Title’) or delete pages containing individual spectra. On the menu select Script/Import/Directory Spectra Stack to automatically open and stack a serie of spectra located under the same folder. 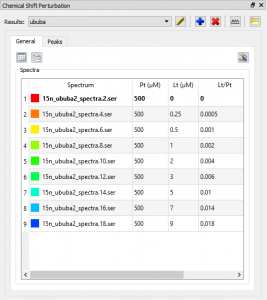 -Select the spectrum from the Stacked Table (in this case raw_data.6.ser) . -Open ‘Properties’ window as described above. -Click on the palette of the 2D entry (it opens the “2D Spectrum Palette” window). -Double click on a color (green or blue) allows user to select a different color for either positive or negative 2D contours. Alternatively it can also be opened from main menu ‘View/Panel/Chemical Shift Perturbation. 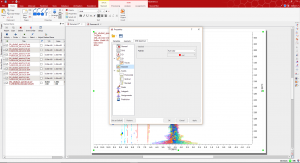 – Add or delete a specific CSP analysis. – Send a peak list to Affinimeter module. – Visualize units and coefficients used in CSP clicking on the ‘Option’ button. 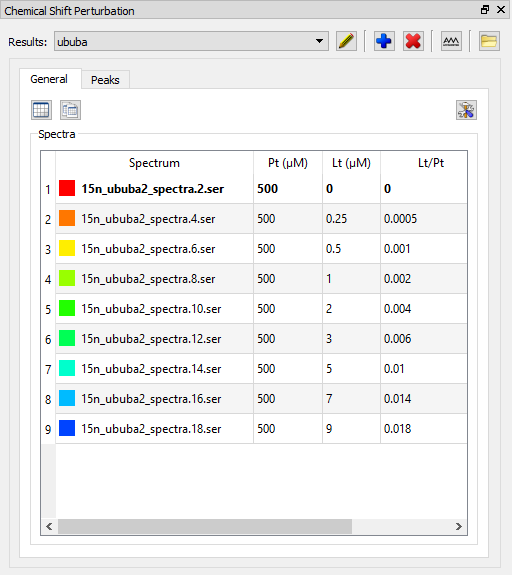 – The table displays the lists of spectra included in the stacked plot. 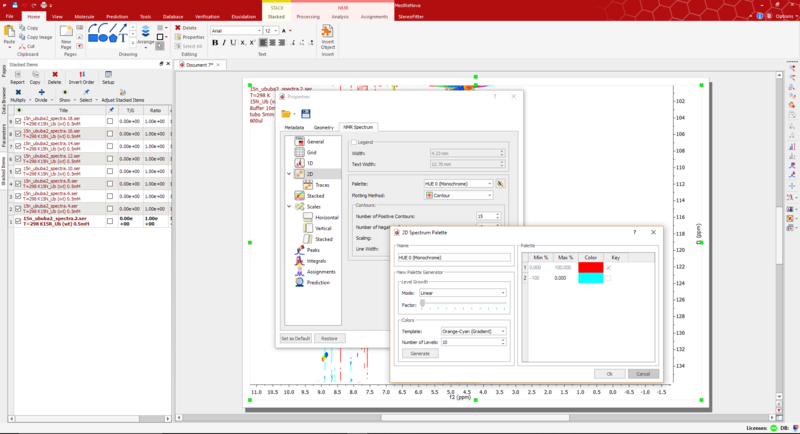 ‘General’ tab: (seen in the figure above) Manual input of protein/ligand ratio where you can Double click on individual cell allows you to prompt the desired numerical value. In case of protein concentration it is assumed that Pt is constant among titration, hence one single input will update all Pt column entries. When you select this option, the cursor enters into “Peak by Peak” modality. It moves between maxima of the different peaks of the active spectrum. Once you select one of these peaks, Mbinding finds and picks the closest peak maxima for each spectrum of the stacked and generates the corresponding Serie. When you select ‘Import Peak List’ you need to load a proper annotation file for the reference spectrum. 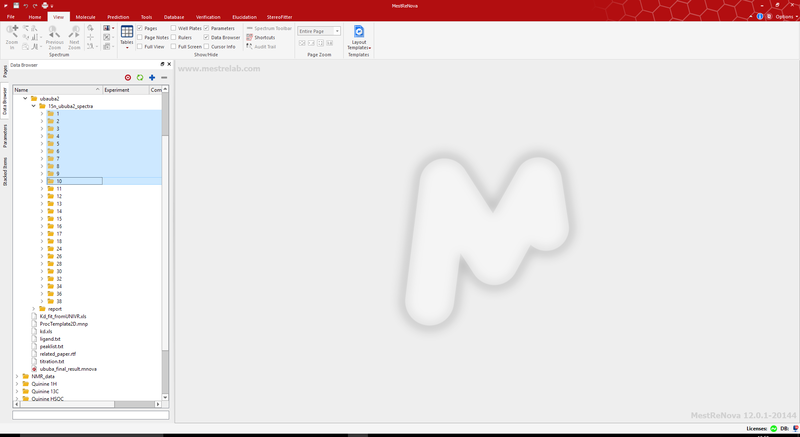 As soon as the annotation file is loaded, Mbinding will automatically generate a peak Series for each line in the annotation file. Series will be named according to their corresponding annotation name. In this modality you need to start with the first spectrum of the series (the reference spectrum with no ligand) with some peaks already picked. As soon as the first peak is picked, the icon ‘Import spectrum peaks’ will become active. 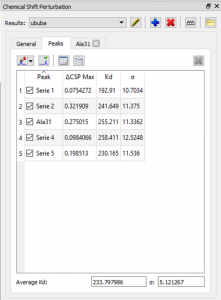 If you click on it, Mbinding module will create a Peak Series for each individual peak picked in the reference spectrum, and for each Series will peak the closest highest peak in all the spectra of the stacked. 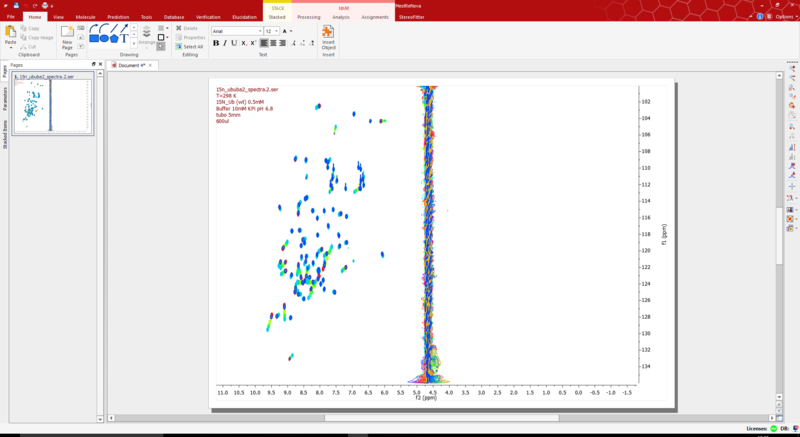 In the example below we have started with peaks picked in the reference spectrum, obtaining five Series in the Mbinding panel. 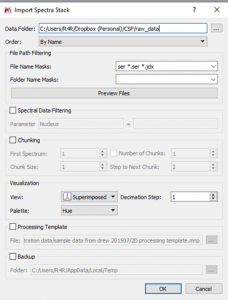 You can double click on any raw (for instance at the level of Series 3) and the corresponding Series tab will be opened zooming into its relative spectral region. A series’ name can be changed directly in the“Annotation” tab. By doing this, all relevant labels of the corresponding Serie are updated. 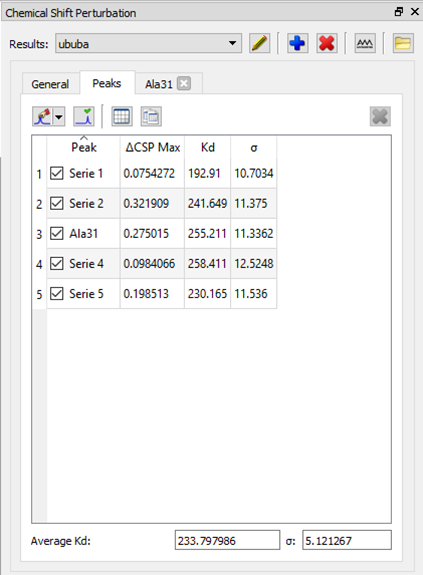 For a particular peak Series the experimental Dd are listed in CSP column, and the relative points (in blue) are scattered in the graph below. Experimental points are then fitted to the proposed equation to retrieve the best Kd value that fits the experimental points. 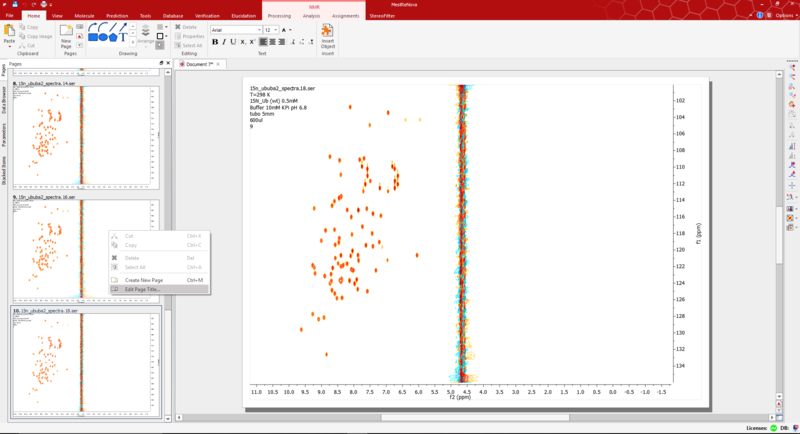 Based on the calculated Kd, Dd are hence back calculated and displayed in the “Calculated CSP” column, and illustrated in the graph as red dots (and a red line). An overall Kd value is computed and displayed at the bottom of the “Peaks” tab. 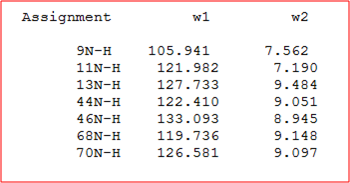 Series contributing to the overall Kd calculation are the ones ticked in the main table. Ticking or unticking a particular Serie will update Kd value on the fly. 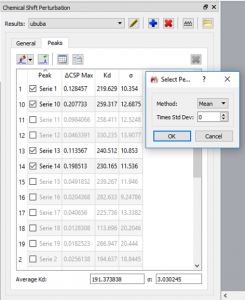 By clicking into “Auto Select Peak” icon, user can define two criteria for selecting peaks to be considered for the overall calculation of Kd: mean or median. In case of “mean” user can moreover select higher threshold counting for the mean + an integer number of standard deviations. In case of median you can decide which quartile to be used (or which one to be excluded). 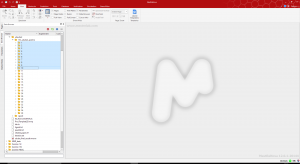 Starting Mbinding module from scratch and by clicking on the folder icon (formally “Create Titration Document”) you will be prompted to select three files and the folder containing your raw data. You can specify series of titrations just by listing them sequentially in the “titration file”. 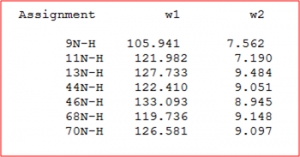 Names for ligands used are coded in the “ligands file”. 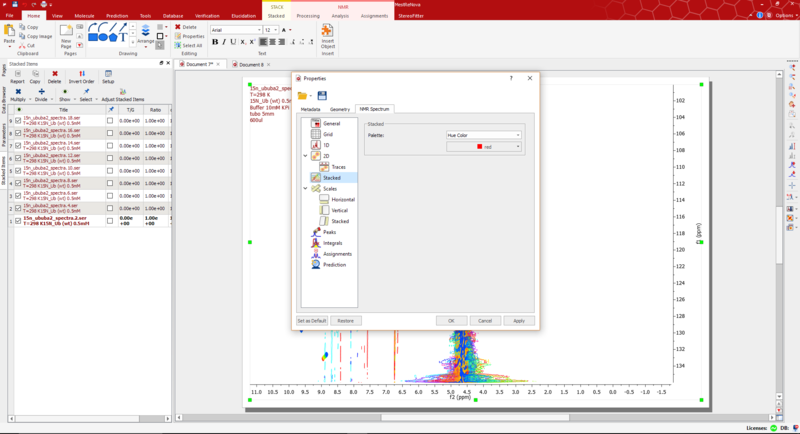 When Mbinding automatically runs the analysis it actually creates different Mnova files for each titration listed in “titration file”, Mnova documents are named accordingly to ligands’ names.